The Book of the Righteous Kickstarter campaign is now live, so please check it out, and give us whatever support you can. Thank you! As fans of Dungeons & Dragons Fifth Edition no doubt know, Green Ronin worked with Wizards of the Coast last year to create two books for the official game line: the super adventure Out of the Abyss and the sourcebook Sword Coast Adventurer’s Guide. This was a great opportunity for Green Ronin and gave us important experience with the 5E rules. When our partnership with Wizards of the Coast was announced, people wondered if we’d be doing more 5E books on our own. 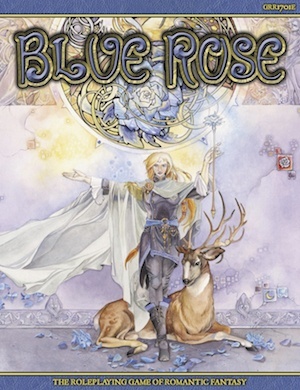 Green Ronin had made its name publishing 3E material as one of the first d20 companies back in 2000 after all. And my own history as a designer stretches back to Second Edition with books like Guide to Hell and Slavers. We decided to wait until WotC had announced the licensing arrangements for 5E though, and a couple of months ago they did just that. 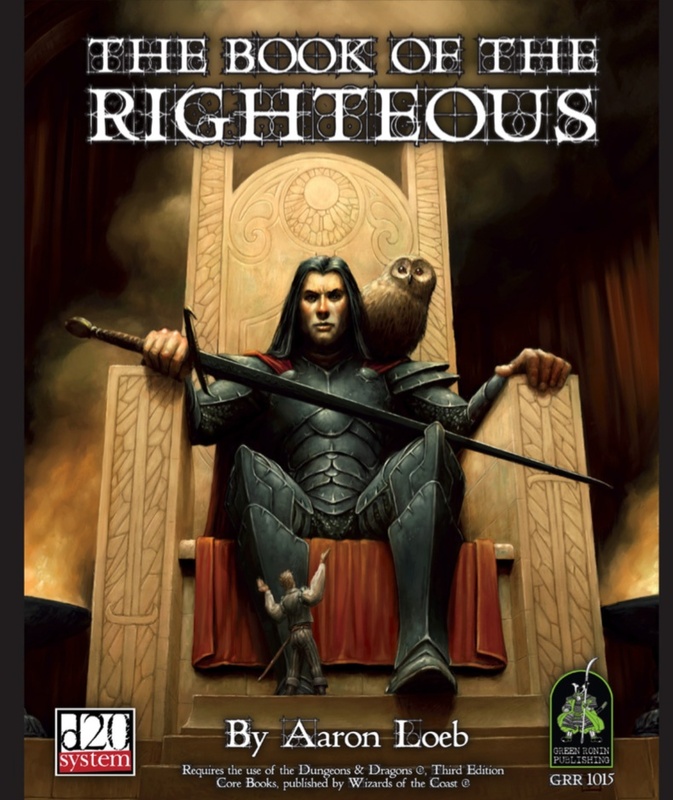 I’m now happy to announce that we will indeed be doing 5E material and we’re going to start by revisiting one of the most critically acclaimed books we published during the d20 era: The Book of the Righteous by Aaron Loeb. 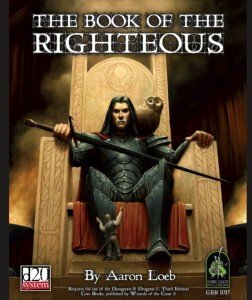 Aaron texted me some months ago and asked, “Why isn’t there a 5E version Book of the Righteous?” I told him that I fully intended to make one if the licensing situation clarified. It did and now here we are! Later this month we’ll be launching a Kickstarter for a new edition of this classic book. 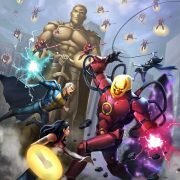 The mechanics will be fully revised for the 5E rules. You may have heard of the person designing the new rules material: one Robert J. Schwalb. 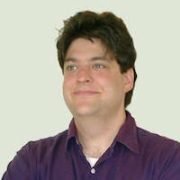 Rob not only worked as our d20 developer for many years, but also went on to work for Wizards of the Coast and was on the design team for D&D 5E. Safe to say that the mechanics are in good hands with Rob and we’re always delighted to get to work with him again. So what is Book of the Righteous? 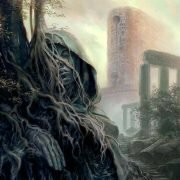 Simply put, one of the most comprehensive pantheons ever seen in roleplaying games. It presents more than 20 pick-up-and-play churches corresponding to gods that feature in most fantasy campaigns (god of war, god of justice, etc.). Each church features lavish detail, including in-depth information on its clerics, holy orders, dogma, prayers, and rituals. These churches can be used in any campaign to bring a whole new level of detail to the religious characters. Plus, for those who don’t have a complete cosmology in their game, the Book of the Righteous provides a comprehensive mythology that unifies all of the gods in the book. That mythology, and its corresponding cosmology, is not tied to an existing campaign setting, making it as portable and useful as our long running Freeport series. If you want in-depth religions for your campaign, The Book of the Righteous is for you. I’m excited to bring back the Book of the Righteous. It’s one of my favorite things that we’ve ever published and the original has been out of print for a long time now. I hope 5E fans embrace it the way 3E fans did before them. 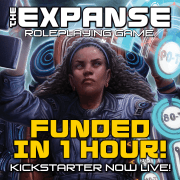 I’ll also be forthright in saying that this Kickstarter is a test of the 5E market for us. If the Book of the Righteous Kickstarter does well, that will tell us that there is demand for 5E material from Green Ronin. If you want to see more of that, back it!